Hello and welcome back everyone to my blog. First off, please allow me to apologize for not getting this out on Thursday like I have said that I plan on doing. My wife and I have recently became foster parents and we got out first placement Wednesday night so our lives have went from just her and I to her, I and 2 kids. Life for us has totally changed, but it has been an awesome journey so far. I am going to try and get a head on posts a little bit and schedule them to post so there wont be any late posts so maybe I can continue to grow my list of followers. It is so exciting to see all the new followers and people liking my facebook page; it makes the time it takes to research and write these posts all that much more worth it, so please continue to share my blog with your friends and please let me know if there is anything in particular that yall might want me to write about and I’ll see what I can do. So, lets move on to the topic at hand, Message Handling. First off lets talk a little bit about the two types of messages. Much like Nets they are formal and informal messages. Informal messages are the predominant type of messages that are passed during a net. An informal message are messages that are not normally written out if they are written at all by the sender. They can also be time critical messages. For example, if something happens at the location that you are at and there are several people that are injured, you may be asked to get medical help to that location ASAP. If this example, rather that sitting down, writing out a formal message, then sending it to wherever it may go to, it is more time effective to just ask for X number of ambulances to come to that location for X number of patients. If you had taken the time to write out the formal message and then sent it it would have wasted valuable time, time that might cost someone their life. Now, I know what you might think, Why would someone ask me to get medical help to come rather than just dialing 911 from their cell or land line phone? Well, if you are helping out during a major disaster, more than likely, phone line will be either down or jammed up and radio communications may be the only way to get that information out. This type of message is also a good choice to use if the message is only going to be handled by two people, the person sending and the person receiving and if that information is simple, clear and has little detail. If the message is going to be handled by two or more people before it reaches its destination, it is better to use the formal method. Another way that this type of message is used is if you are talking on a net and the net control can not hear a station but you can, you can relay the traffic between the station and net control. On the flip side of this is the formal messages. These messages most commonly use the ARRL’s NTS message format. A formal message type is best used when two or more people will be handling the message before it reaches its final recipient. If the information contained in the message is critical or contains important detail, it is best to use the formal format. 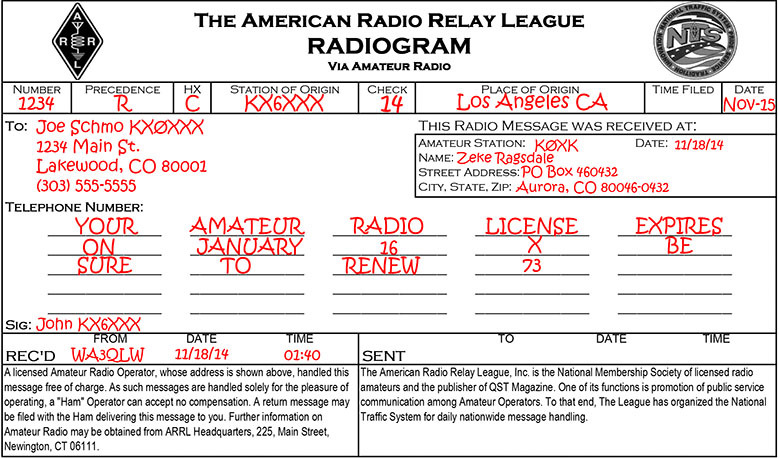 Above is an example of a filled out ARRL Radiogram message. This will give you a general idea about what it looks like and how to fill it out. In my next post we will go into further detail on how to fill one of these out and how to send/receive a formal message. If you have already looked at the picture above you might have noticed the signature line, if not, well there is one and it is a very important piece of the message. Sometimes when you are working a disaster and you are stationed at a shelter for example, some items that might be requested needs the authority of the shelter manager or someone that is “in charge” of the shelter. Items that may be in short supply or maybe have a short “shelf life” or especially if they are expensive will definitely need to have the authorization of someone high up the food chain so to speak than you as a communicator. Also some served agencies will only respond to properly authorized requests. Also, on the included signature make sure that you include the name and the position title. In the ARRL’s Emergency Communication Handbook it gives a great example of why having a signature and using a formal message type is a good thing and I think I will share it here. Consider the following scenario: There are 330 hurricane evacuees in an American Red Cross shelter. ARES is providing communications, working in 12 hour shifts. An elderly diabetic woman is brought in at 1400 hours. She will require her next dose of insulin by 2300 hours. the manager goes to the radio room. There is an operator wearing a red baseball hat with funny numbers and letters on it. He asks the operator to inform the county EOC of the medication need. The operator calls the American Red Cross EOC and says, “Hey, we have a diabetic lady here who will need insulin by 2300 hours,” but doesn’t write the message down or log the request. At 2030 hours, the medications has still not been delivered. The shelter manager goes to the radio room to inquire about its status. There is now a different person with a blue baseball cap with a new set of funny letters and numbers. He knows nothing of the earlier request, but promises to “check on it.” In the meantime, EOC personnel have discarded the message because it was written on a scrap of paper and had no signature authorizing the order for medication. No one sent a return message requesting authorization. If each operator had generated and properly logged a formal message, with an authorized signature, it would be a relatively simple matter to track. The informal message has no tracks to follow. Also by sending a formal message, you are nearly guaranteeing that the receiving station will write it down property (with a signature) and log it, greatly enhancing its chances of being delivered intact. One of the things that was mentioned in the above example was logging the message. An accurate record of formal, or maybe even informal to a certain degree, messages handled and various aspects of your station’s operation can be very useful and is even required by law in some cases. With accurate logs, any logs or misdirected messages can be tracked down later on and a critique of the operation afterwards can be more accurate. All logs should contain enough information to be understandable later on, especially the date and time. So what information should you put in your logs? Al incoming and outgoing messages. One thing that we all must be reminded of from time to time is that our job is to communicate. We are there to pass traffic from our station to another or visa versa. That means that unless you are specifically trained and have the authorization to do so, most message that you pass should be generated and signed by the served agency. There are some exceptions to this though. If the message that you are passing has to do with your station, like relief personal, water or food needs, etc, then it is okay to generate the message yourself. The last thing that we will be talking about, sorry about the length of this post and I hope that yall are still with me, is Message Security and Privacy. Now granted information that is transmitted over amateur radio can never be totally secure since the FCC prohibits the use of codes to obscure the meaning of a message. Anyone with a scanner can hear what is said on voice nets. There has even been reports of news people purchasing digital mode decoding software in order to intercept ham radio communications during a disaster. All of this being said, that doesn’t mean that you, as a communicator, should tell others about the information that you passed while working a shift. While you can not keep people from listening on a scanner and getting information, you can make sure that they don’t get the information directly from you. Something else that you must consider when working in a disaster, never transmit personal information via amateur radio. You should especially never transmit any death information over the air, this should all be done via some kind of secure communications, like telephone, landline fax, courier or a secure served agency radio or data circuit. While we can never guarantee that a message will not be overheard, there are things that we can do to reduce the likelihood of casual listeners picking up on your transmissions. Use a digital mode like packet, PSK31, fax, RTTY, etc. Do not discuss frequencies or modes to be used openly on voice channels. Avoid putting certain ARES/RACES net frequencies on websites or in any public document. You could even go as far as having a standard form when when you pass information on you could say like, “Line 3 15, line 14 20%.” Since you are both using the same form the receiving station is just filling in the blanks. Anyone listening with out the form will not know exactly what you are talking about but “as long as encryption is not the primary intent, this practice should not violate FCC Rules” as stated in the ARRL Emergency Communications Handbook. Ok guys and gals, I think that about covers it until the next post where like I said above we will be going over the ARRL’s NTS formal message form, the radiogram. I want to thank yall for reading my blog and please share this with your friends. Please subscribe to my blog and like my Facebook page or follow me on Twitter. Links to both can be found in the top right corner of this page.